There are 2 common ways to get a visa to Vietnam: getting Vietnam visa at the Vietnam Embassy (traditional applicatyion) or getting Vietnam visa on arrival (online application). 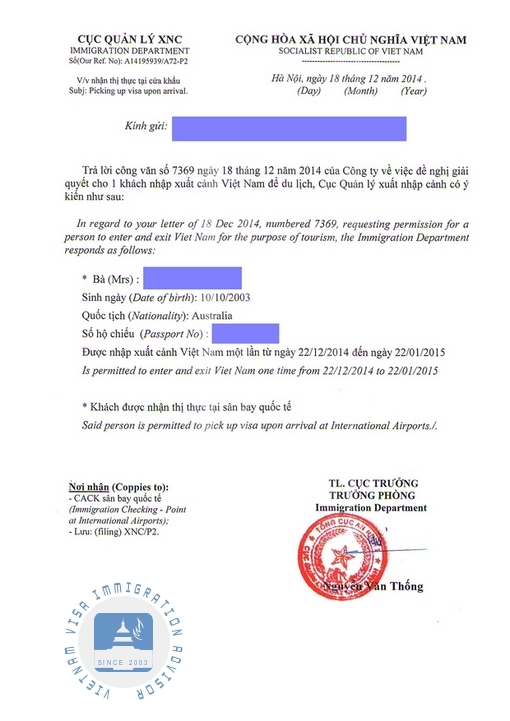 ** Remember to prepare full the required documents for visa application at the Vietnam Embassy in Australia before coming there to save you time. Visa on arrival is the process that you will apply for a visa online then pickup visa upon arrival airports in Vietnam – Hanoi (Noi Bai International Airport), Ho Chi Minh City (Tan Son Nhat International Airport), Da Nang (Da Nang International Airport) or Nha Trang (Cam Ranh International Airport). It is a legitimate alternative to obtaining a full visa stamp from the Vietnam Embassy in Australia with simple process and much cheaper cost. It is beneficial for those who do not have much free time to apply for visa in person at the Vietnam Embassy or those who is residing in the cities with no Vietnam Embassy or Consulates nearby. What the approval letter for Australian looks like? How to apply Vietnam visa for the citizens of Kazakhstan?